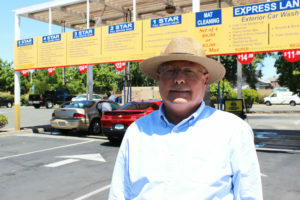 5- Star Car Wash and Detail Center is Solano County’s finest full service car wash. It opened its doors for operation in June of 1998, and expanded with a second location in 2007. Through the years 5 Star Car Wash has continued to excel at meeting their customer’s needs. Within twenty minutes a customer can expect a car that is clean inside and out! If you are short on time express exterior washes are also available, and you will be in and out in less than 10 minutes. The wash process is extremely safe and effective. 5 Star Car Wash uses state of the art touchless, soft cloth, and computer technology to flush off surface contamination. This eliminates the potential for road dirt and grime to leave micro scratches in the clear coat. The vehicle is bathed in high quality waxes , and mild soaps that are designed to improve shine. 5 Star Star Car Wash and Detail Center also provides professional detail services such as hand waxes, carpet, upholstery , leather and engine cleaning. In addition, the highly trained detail staff excel at reconditioning paint to make it look it’s best. They offer tar, overspray, hard water, and oxidation removal. . While your car is getting the best of care, you can relax comfortably in the air conditioned lobby, or on the shaded patio while enjoying free freshly ground coffee or a snack. There is also a gift shop where you can stock up on car care accessories.